Royal Jelly is a milky secretion derived from the pharyngeal glands of the honey bee. This 'super food' of the bees is specially blended with enzymes and fed to each bee destined to become a queen. It is the exclusive food of the queen bee throughout her highly productive life, enabling her to lay up to 3,000 eggs per day during her six-year lifespan. Worker bees eating ordinary honey live only four to six weeks. 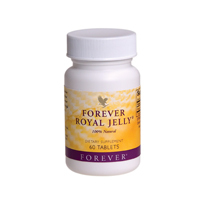 Royal Jelly contains vitamins A, C, D, and E and is also a rich natural storehouse of the B-complex vitamins. A major ingredient is vitamin B5 (Pantothenic Acid), one of the most important substances in the body, essential for the synthesis and metabolism of proteins, fats, carbohydrates and several hormones. Royal Jelly contains a balanced blend of trace elements including amino acids, calcium, copper, iron, phosphorous, potassium, silicon, sulphur and nucleic acid. Our exclusive Royal Jelly is gathered from dry, remote, high desert regions where pristine conditions provide the ideal environment. It is extracted from the hive and immediately freeze-dried to remove only the excess water from the product, leaving the other elements intact. Take one tablet, twice a daily, preferably before meals.